Sometimes – especially when I overdose reading press - I wonder if there's still any raison d'être for live shows. Currently people are attacked by attractions everywhere they turn – any gadget, social media platform, screen, billboards or paper screams that loud that brain has trouble processing it all. Everything is available in an instant, effortlessly, with just but one click. Does anyone need any more adrenaline? I've read that people do not feel like participating in mass events any more, they do not want to share the common fun experience, they prefer their own apartments to keep them safe. That's what I read in press reports. And then I go for a concert and the only thing left for me to do is to laugh out loud - when I see the queue in front of the club, I hear excited voices and then participate – together with the others – I a magnificent spectacle of music, lights and energy sharing I now the spirit of common music enjoyment is not dead – on the contrary – it's doing just fine. And I find a big comfort in it. Long awaited grand finale of Coma Alliance Tour with In Strict Confidence as a supporting band finally took place. On 26th of January in Reithalle Strasse E the stars sparkled and dazzled the gathered crowd by giving so much beauty and sensation that everyone could feel emotionally looked after. I think a lot of people had been watching carefully the new project's evolve - both Diary of Dreams and Diorama, whose leaders, Adrian Hates and Torben Wendt set the said project – are extremely popular in Poland and have a large and devoted fanbase. After Adrian Hates's experiments with harsh industrial project com.kill, the time had come for a collaboration that seemed to be a natural consequence of the story that both leaders share. After many years of supporting each other within their own projects they joint forces and as two strong identities they created Coma Alliance. Following a well acclaimed album "Weapon of Choice" release, that was out on 16th of November 2018, the band started on tour visiting the most important cities in Germany. The final was, like I already mentioned, set in Dresden. There are still two shows ahead - both in Russia (Moscow and St. Petersburg) And next? The time will show. As a support during the tour in Germany we could see the well-known project In Strict Confidence. We could see them play in Poland, for example during Castle Party – they have been active since the 90s and they have an extremely rich and diversified discography on their account. It was up to them to start the night and I must admit it was a strong and intensive kick off. The songs presented during the show combined both the well-known hits, such as the most recognizable "Zauberschloss", but also pieces of some older albums such as "Laugh, Cry and Scream" of 2012, "Somebody Else's Dream (2016) or "Mercy" and "Hate to Love" (released in 2018). The combination of strong, intensive, hoarse vocal of Dennis Ostermann and dynamic music coalescing electronics with guitar and piano passages, set for incredible and sharp sonic experience. Dancy, vibrating rhythms plus an amazing show were a feast for both eyes and ears. At some point Haydee Sparks turned up on the stage wearing beautiful wings decorated with little, colourful lights and presented her graceful dance. It was a fine performance, indeed. Spectacular display of lights and visuals, skilful mastering of light and darkness, enhanced the atmosphere in a great way – it was both emotionally loaded, energizing and dancy. After a short break, the lights were shut down and it was a signal the time for Coma Alliance show had come. While waiting impatiently in complete darkness we could only hear some unsettling, dark sounds of slowly arising melody of "Unusual". With every beat our hearts would reach syntony with the rhythm, speed up and run, rising the adrenaline level up to the top pitch. Gradually the spotlights would start to shed some light to the stage and while the musicians were entering the stage accompanied by wild, deafening applause of the audience we could watch Zura Dzagnidze performing the most incredible show using a violin bow to create the most alarming, intriguing sounds. Straight from the dark soundscape we were taken to the magic of the already cult song "Royd". Adrian Hates greeted the audience and in accompaniment of arising applause, the concert started for good. 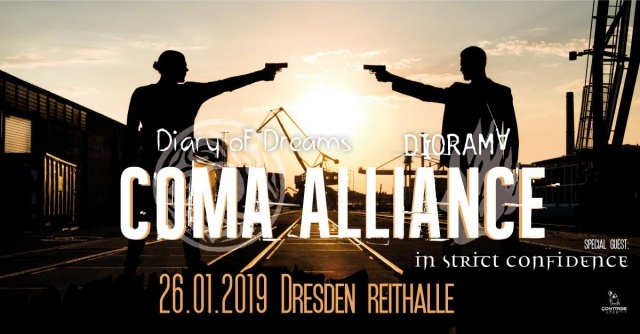 The pace and intensity of the show was impressive – I had a feeling the amount of sounds, emotions and beauty of the selected songs was far too much a heart of an average Coma Alliance, Diorama and Diary of Dreams fan could take for once. The pieces presented were in a big part the songs of "Weapon of Choice" album, which in its variety stands for a free flow from emotional dark passages to triphop dancy, hypnotizing ones. We could also hear the very best of what the artists created in their individual bands - it was enough to hear "Ignite", "Retaliation", "Butterfly Dance" or "Child of Entertainment" to sweep me off my feet, raise total enthusiasm and stun me emotionally. The setlist was organized in a way to make CA songs intermingle with hits of Diorama and Diary of Dreams – enough to think what it is like to hear the most beloved songs performed by favourite artists, often in a form of a vocalic duel, sang in duo in the setting of beautiful lights, visuals, scenic movement and dance. It was extremely intensive, beautiful and moving feeling. Only the music itself would have been enough to make any heart happy, but what we were also given an amazing, vibrating show. The moments of concentration, silence and emotional bliss were set against the moments of total scenic frenzy, dance, crazy antics, vocalic duels, the musicians jumping on and off the scenic gear and each other (e.g. Torben felt like jumping onto Zura's and Max's back so it looked a bit like a gang of boys playing) - really nobody seemed to spare energy for better times during that concert. Add to it the most splendid contact with the audience, warmth and energy emanating from the stage and there you go – a real blast. I have not seen such a beautiful concert for a long time, and I've seen them many. It was one big highlight! I had a feeling the artists enjoy the concert as well and it was a really nice feeling; it would make me smile almost automatically. The audience's reaction was enthusiastic – there were three (!) encores. The most beautiful and heart-touching moment, however, was the performance of "Traumtänzer" together with the audience. The song is extremely important for many fans, it carries intensive emotional load so having it during the concert was like a shot straight to the heart. Stylish, atmospheric lights, Torben and Adrian standing at the edge of the stage, singing in duo, their warm voices slowly intermingling and running in one line, the sea of hands reaching towards the stage and the mesmerising, magical music. To see and hear how the entire hall was filled with voices singing that particular song – it was the moment worth of every journey. I saw many eyes sparkling with tears, happy faces and the sea of hands. Fantastic, unforgettable experience. It's what I can also say to summarize the entire show – if you have something important in your life, like the music that constitutes the integral part of your emotional and spiritual history, if it accompanies you in some crucial moments, gives you support, retreat or healing, if it's the part of who you are – it's worth celebrating it. Substantial, compelling, important elements are the value in itself – the music of artists of Coma Alliance is definitely a gem in many private soul jewel cases. A precious gift. Thank you for the evening, looking forward to what's to come.